I am ALWAYS struggling for new and creative lunch ideas. Breakfast and dinner come easy for me to whip something up, but lunch- it can sometimes be the rushed and hurried meal of the day. Lunch for me is something I know I gotta do, but doesn’t get a second thought. I have really been trying to change that lately and form better habits that incorporate healthy and fresh ingredients that doesn’t leave me feeling heavy and tired throughout my remainder of the day. Do you need a new light and fresh lunch/dinner idea?! Well these Asian Chicken Wraps will hit the spot! They are jam packed with delicious flavor, stuffed with yummy ingredients and will leave you feeling satisfied and full. This a new and fresh lunch/dinner idea that is packed with delicious flavor and stuffed with tasty ingredients! Assemble ingredients on the wrap and fold burrito style. Lunch is my most hurried meal of the day too and when Kevin is home for the day, it's usually just us snacking to make a suitable meal! I love these wraps Nikki. 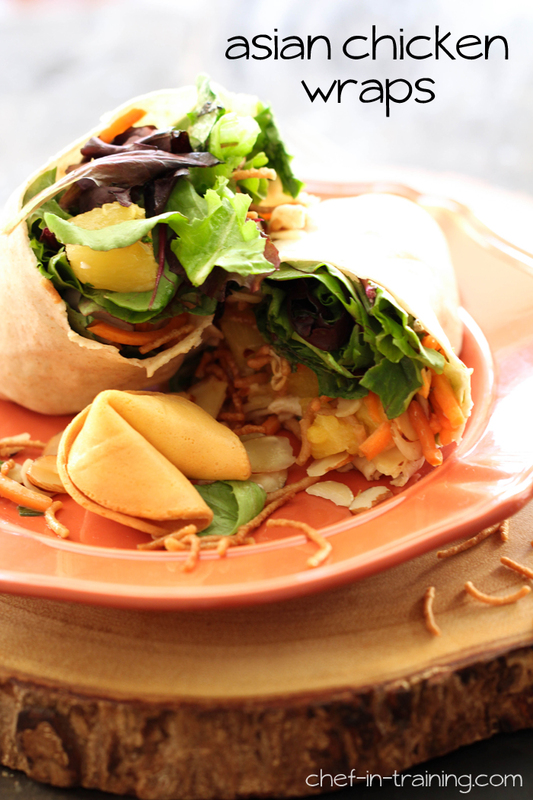 Asian inspired wraps like this are my favorite kind. I've made lettuce wraps like this before. Yum! So sorry about that. It should be there now. Please let me know if you have any more troubles.